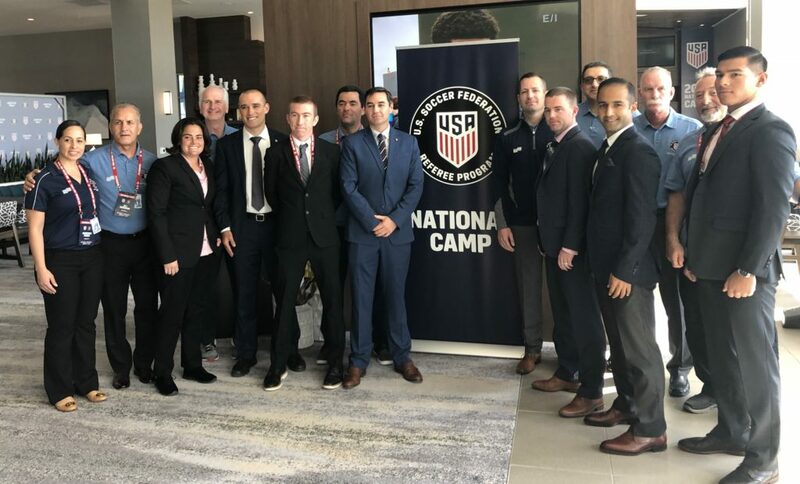 CNRA sat down with National Referee Turan Ozdemir and National Assistant Referee Stephen McGonagle to discuss National Camp 2019, the highlight of their careers thus far, what advice they’d give to aspiring young referees, and more! From January 10th to the 13th, just under 100 of the best referees and assistant referees in the country gathered at the IMG Academy in Bradenton, Florida in the hopes of completing the last requirements in their quests to maintain their national badges, or finally upgrade from a Grade 5 to become one of US Soccer’s newly minted Nationals. Cal North Referee Turan Ozdemir and Assistant Referee Stephen McGonagle were among the group about to embark on a year with eight more letters on their badges. Congratulations, you got your National Camp invitation! What was that like? Turan: I was relieved when I received the invite. I have been working hard, day and night and was looking forward to being a part of nationally recognized elite referees. Being invited to such an event not only boosts your confidence but it also gives you more motivation to work harder and continue focus on your bigger goals. Stephen: I had a mix of emotions when I opened up the e-mail, and it took me a while to actually come to terms with what the invite meant. The National Referee Program is a group of officials that I have looked up to since I first picked up the whistle a decade ago, and finding out that I was being invited to be a part of the group was humbling to say the least. I experienced a further sense of gratitude for all of those who have helped me along the road and continue to support me in my journey. What was the best part of National Camp? T: For me the best part was listening to Mark Geiger [Former FIFA Referee], Jair Marrufo [FIFA Referee] and Corey Rockwell [FIFA Assistant Referee] share their 2018 Russia World Cup experience. It was truly exceptional in any way and I felt inspired by their story. Jair especially made an outstanding impression on me by sharing his inspirational transformation. S: Being a part of such an elite group of officials, even for a short amount of time, felt oddly like a family reunion of sorts. In my opinion, being able to interact with so many of the men and women who I personally spend so much time watching and learning from was one of the more memorable parts of camp. Similarly, I always enjoy meeting other officials from across the country and establishing new and lifelong friendships. What were a few takeaways from National Camp? T: Number 1 take away for me was to be ready and in top shape at all times. Continue working hard, continue doing the best you can and one day your hard work will pay off. Control what you can control, be sharp with the LOTG, take care of yourself physically and emotionally and just wait for your chance. You will be the best only when you work towards being your best. S: I think my biggest takeaway was despite the fact that everyone at camp had already established a certain degree of incredible success in their careers, each individual shared a common goal of constantly pushing to achieve new heights. More than anything it was evident that complacency in reaching a certain level of officiating deters even more progress from being made. Another aspect that I took away from several of our incredible presentations was the fact that soccer, and more specifically soccer officiating, has reached unprecedented heights in the past decade and will only continue to improve. 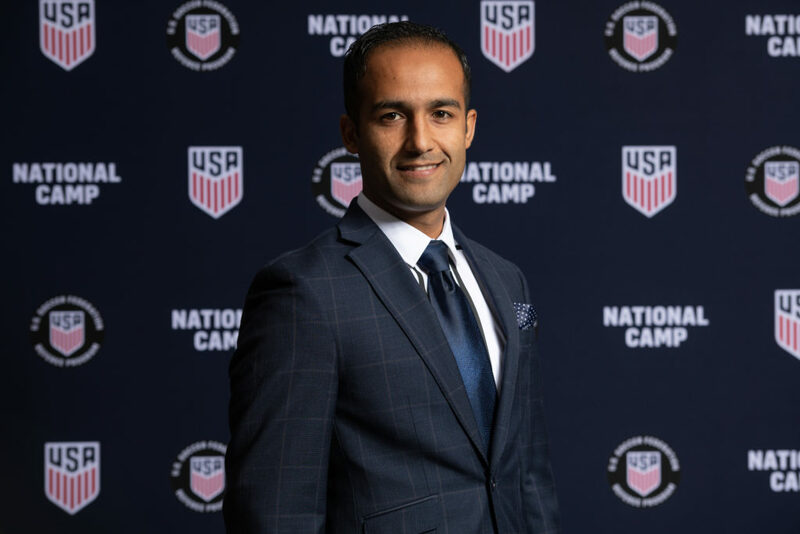 With the continued investment across all governing bodies, more and more soccer officials not only in the United States but across the world are achieving success as a result of their lifelong dedication. How did you get started on your journey as a referee? T: I started refereeing in February 2007. At first I wanted to do it as a hobby and to be part of the game I appreciate the most, but then I quickly realized being on the field of play with players is what I am born for! S: I started officiating when I was 14 years old as a way to earn money on the weekends while still participating in sports at the same time. Over time my love for officiating soccer evolved into my primary hobby, eventually prompting me to quit playing sports all together in order to dedicate myself to progressing as an official. What match stands out the most in your career thus far? T: I guess I could say being a 4th official in an international friendly between Barcelona and Milan. I should also mention the crazy 2013 SFSFL final with 2 red cards, a PK and a last minute goal to secure El Farolito the championship with a 2-1 win versus Olympic Club. S: It would have to be a friendly between Club America and Monarcas Morelia at Avaya Stadium. It’s not every day that you get to be part of such an incredible environment between two historic Mexican clubs. T: My biggest goal is to referee in the 2026 World Cup. I am putting in my best effort, becoming a better self and each day working towards that bit by bit. S: At this time I am incredibly grateful to be part of such an elite group of soccer officials and will continue to push toward becoming the best official I can be. I am proud to represent my community and US Soccer a National Assistant Referee and am eager to continue working towards whatever the future holds. What advice would you give to referees who have aspirations to become National Referees? T: As mentioned before, my advice would be to work hard, be on top of your game and watch experienced officials work. Seek out the opportunities to talk to those who have been to places you want to be and learn from their experiences. Watch a game a day if you can! S: I have found that commitment and coachability are two of the founding pillars of developing oneself as a soccer official. 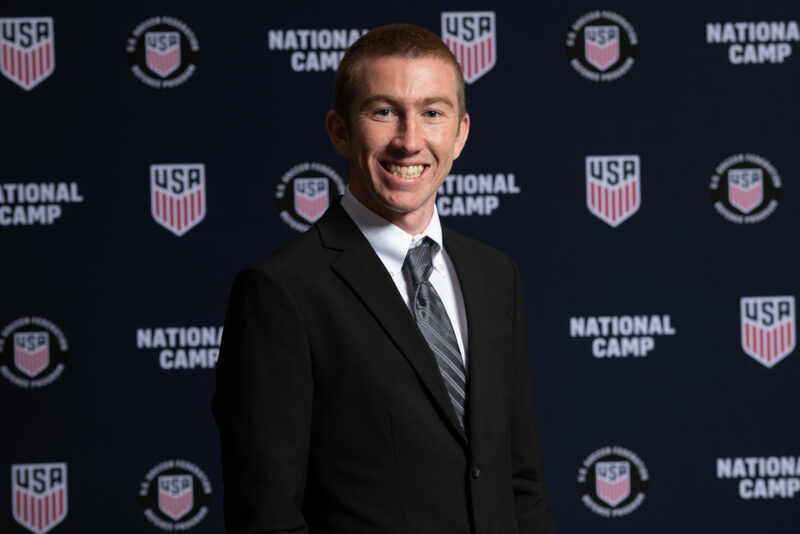 Without question, if your goal is to become a National Referee, the process of going from an entry-level official to being a part of the National Referee Program is going to be equally as challenging and demanding as it is rewarding, if not more. In truth, it is that level of commitment, your ability to persevere through challenges and mistakes, is what defines those who are fortunate enough to be a part of the National Referee Program. I am a firm believer that regardless of where you are located in the country and what level of soccer you are currently officiating, there are always officials and mentors around you that have the ability to offer you guidance throughout your career. Although some of this guidance may be more constructive and beneficial than others, the key to developing oneself as an official is having the ability to recognize that both self-analysis and listening to the feedback of others is the key to improving, and likewise an essential element of establishing long-term support systems. In reality, you will not find an official that hasn’t made a multitude of mistakes in their career, but it is only those who are able to admit those mistakes and learn from them that are able optimize their officiating as a result of their coachability. Lastly, I have found that patience is an essential element to progressing as a soccer official. In a similar fashion that athletes take years of meticulous training and development to establish and refine their craft in order to make it to the professional level, the same can be said about aspiring officials who hope to become National Referees. The process to becoming a National Referee is long and emotionally taxing, but the difficulty of the journey is what makes the end goal so rewarding.